ENERGY STAR certified commercial water heaters include gas-fired storage and gas-fired instantaneous (also referred to as tankless) units that use around 15 percent less energy than conventional commercial units by employing more efficient heat exchangers. The ENERGY STAR label is now available for electric heat pump water heaters as well. These units transfer ambient heat to the water using a refrigerant-based system, using less than half the energy of an electric resistance unit. On an annual basis, an ENERGY STAR commercial electric heat pump water heater would be expected to save at least 10 MWh with an emissions savings equivalent to removing 1.5 cars from the road per year. If all commercial water heaters sold in the U.S. were ENERGY STAR certified, the energy cost savings would grow to nearly $900 million and more than 17 billion pounds of annual greenhouse gas emissions would be prevented. The ENERGY STAR Commercial Water Heater specification covers high-efficiency gas-fired storage, gas-fired instantaneous, and electric heat pump water heaters. Electric heat pump water heaters (HPWH) use less than half the energy of a conventional electric resistance water heater. Most commercial HPWHs are used as pre–heaters, in combination with a regular water heater and tank, but some are designed to satisfy entire hot water loads. A Federal test method was established for commercial HPWHs in 2016 and these products are now included in the ENERGY STAR program! Electric heat pump water heaters are ideal for facilities with hotter ambient conditions (at least 40°F year-round) and large hot water loads such as a kitchen environment or laundry facility. If your facility currently heats water with an old electric resistance storage water heater and uses 600 or more gallons of hot water over the course of a day, you should consider installing an electric heat pump water heater. Aside from providing efficient water heating, HPWHs also provide space cooling, thus reducing costs associated with both water heating and air-conditioning. Could refill their 80, 60, and 40 gallon kettles with 160 degree F water, since tankless units can provide an endless supply of hot water. Saved space by moving the tankless units outdoors. Manifolded together two tankless units to meet the overall water needs and be able to supply hot water if one of the units failed. The third unit was dedicated to the kettles. ENERGY STAR certified commercial gas water heaters are condensing, and need a drain line to dispose of condensate. Some combustion byproducts cause this condensate to be acidic, which can be corrosive to certain materials. Plastic piping typically used in new construction is not affected by this. However, acidic condensate can damage cast iron piping, which may be present in some existing facilities. In these facilities, you must either replace the drain lines with plastic or some other material immune to the effects of the acid, or install a neutralizer. A neutralizer is a device containing a base material (e.g., limestone chips) that counters the acid and eliminates the corrosive effects of the condensate. In commercial food service facilities, cleaning agents used during the dish washing process are known to neutralize acids. A neutralizer is not necessary in this situation as long the condensate line from the water heater is connected downstream from the dishwasher. ENERGY STAR certified gas water heaters are not compatible with natural draft vent systems. When a standard efficiency gas water heater is replaced with a condensing model such as those meeting ENERGY STAR standards, the existing vent system will not work properly. Condensing water heaters are typically power–vented and include a fan that can exhaust combustion gases up to 60 feet horizontally through plastic pipes. The end cap of this exhaust must be above the snow line or other obstructions. The vent also must be sloped toward the water heater so that any condensate formed is directed back toward the drain and does not freeze on the end cap, which could block the exhaust. For commercial kitchens, please see Design Guide Improving Commercial Kitchen Hot Water System Performance Energy Efficient Heating, Delivery and Use for a comprehensive overview of how a restaurant designer or engineer can use innovative strategies to deliver the service of hot water as efficiently as possible by: (1) reducing hot water use of equipment and faucets while maintaining performance; (2) increasing the efficiency of water heaters and distribution systems; (3) improving hot water delivery performance to hand washing sinks; and (4) incorporating “free–heating” technologies like waste heat recovery and solar pre–heating. Electric Power Research Institute. 2015. Commercial heat pump water heaters: Evaluation of field performance for San Diego Gas and Electric (SDG&E). Retrieved from https://www.epri.com/#/pages/product/3002005496/?lang=en. 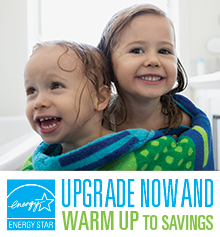 An ENERGY STAR certified commercial water heater can save nearly $850 annually.